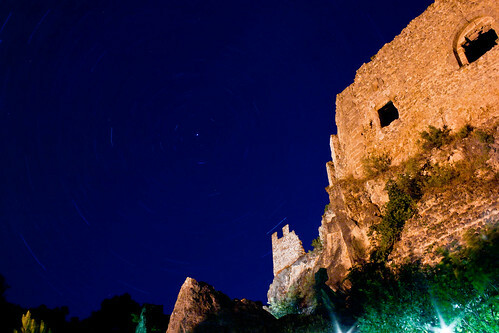 Trouble with Long Exposures – Part 1 of 2. 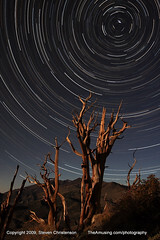 I administer a group on Flickr called “Star Trails” and moderate a group called “Best of Star Trails“. The good news is there is a constant source of new exciting photography there… and a fair number of beginners facing some common problems. Some of the problems are due to limitations in the camera, and some are due to the selection of exposure time, ISO, f-stop or focus. Some are due to cockpit errors of the kind I described in my August 13th article: Many Paths to Failure regarding unattended shooting with an intervalometer. This list is in addition to those problems and in a way is a bit more fundamental. 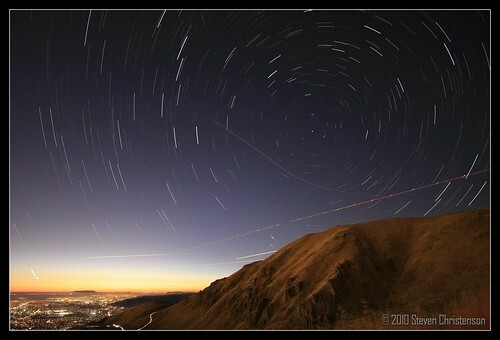 Gaps in Star Trails – see part 2. Lots of Noise (Colored Speckles) – see part 2. Let’s tackle those one at a time. An unsteady tripod (often noticeable when there is wind). And it may not just be the tripod. Check the quick mount plate and the tension on the knobs. Condensation (that is dew) on the lens. Use a lens hood (helps), and if really bad a lens heater. 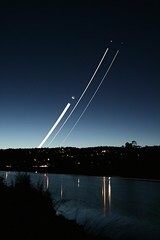 Photo 1: f/18, ISO 100 for 30 minutes. Photo 2: f/20 ISO 400. In Photo 1 a small aperture allows greater depth of field so that focus is sharp from the foreground to infinity but that small aperture also diminishes the contrast in the stars. 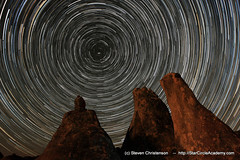 Taken to an extreme a high f-stop (tiny aperture) with stars can produce an effect like that in Photo 2 by Vincent Miu which was a runner up in the 2009 Astronomy Photographer of the Year contest. The very small aperture, f/20, eliminates all but the brightest elements from the night sky. Photo 3: f/3.5 at ISO 640: A lot of stars make for a pleasantly dizzying image. Photo 3 was shot at f/3.5 ISO 640, while Photo 4 was f/4, ISO 100. 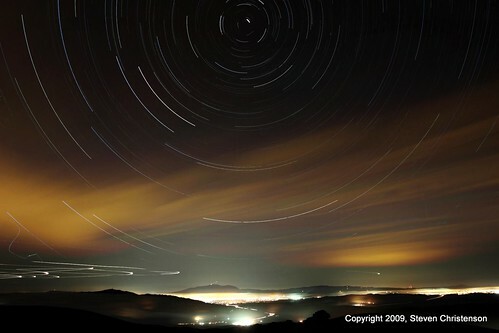 Both include about the the same star field but many more stars are present in the higher ISO shot. Even if you are not trying to reduce the number of stars in the field, you might be forced to use a smaller aperture to get more depth of field. Another common problem that causes reduction in contrast is sky glow. When the sky itself begins to lighten you can be sure that the stars will not contrast well. The best way to control this is to take shorter exposures and later at night – or on a clearer night (cold winter nights produce the clearest skies). The moon is also a huge source of glow. Treat the glowing moon just as you do artificial light glow – reduce your exposure length (and ISO) to take pictures when the moon is strong. But do not give up just because you can barely make out stars in your night sky – the camera can see them better than you can! Photo 6 is a perfect example. The city glow made it impossible to see more than 8 or 9 stars toward the north and yet the star trails are quite present. The presence of artificial light. Photo 5: White balance problem due to different types of light. In this image I compromised to keep the colors on the land as natural as possible. Getting the white balance right is not hard except when there is lot of artificial light – streetlights, city glow, etc. Unfortunately there are many different types of lights each with their own color characteristics. The popular low pressure sodium vapor lights are nearly monochromatic yellow-brown in color. There is really no way to get a naturally colored look when sodium lights predominate the scene. Florescent, tungsten, LED, and other light types all differ in their color profiles and when several different sources are in play for a scene it gets harder to keep a natural looking scene. Sometimes when handed lemons you can make lemonade as in Photo 6. I could not correct for the predominate sodium vapor lights so instead of fighting I adjusted the color temperature to make the foreground elements look as natural as I could and did not worry that the stars became white – most people think of them as white anyway. It certainly helps that the image also includes a portion of twilight illumination to help keep the scene realistic looking. Photo 6: When corrected for the sodium vapor lights the mountain looks almost natural, but the stars have lost their color. Some cameras, particularly older models may suffer from “amp noise”. The glow or noise is usually visible at the corners or edges of the photograph and usually only with longish exposures (over 8 minutes). Here is an example from Ethan Doerr of what “amp noise” may look like. If your camera is subject to amp glow there are some tactics you can try. 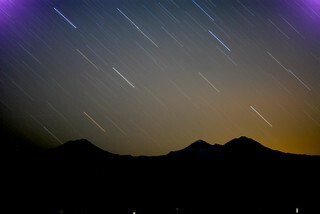 The simplest is to keep your exposures short and stack them. Or perhaps allow the camera to cool down from time to time. Or only shoot in Antarctica ;-). For more Trouble with Long Exposures see Part 2. This entry was posted in Color Correction, Focus, Image, Noise Reduction, Photo Tip, Sensor, Stacking, Workshop and tagged amp noise, blur, color balance, dim stars, edge colors, exposure, exposure problems, focus, gaps, gaps in star trails, lack of contrast, noise, noise reduction, pink glow, purple glow on October 1, 2010 by Steven Christenson.